This website on spiders of Siberia was developed by Russian entomologist Oleg Berlï¿½v. The site contains species lists for more than 20 families including Oxyopidae, Gnaphosidae, Lycosidae, and Salticidae, to name a few. In addition, the site features a number of excellent, close-up photographs of several spider species such as Araneus nordmanni, Argyroneta aquatica, Steatoda grossa, and Aculepeira ceropegia. 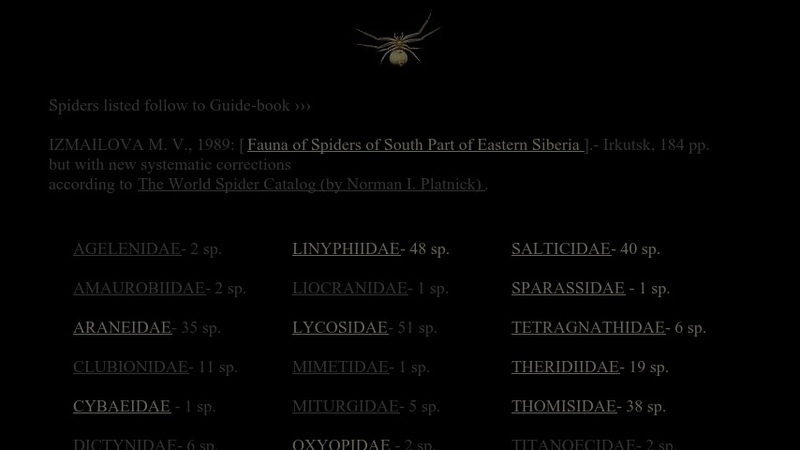 This website also references and links to The World Spider Catalog located on the American Museum of Natural History website.